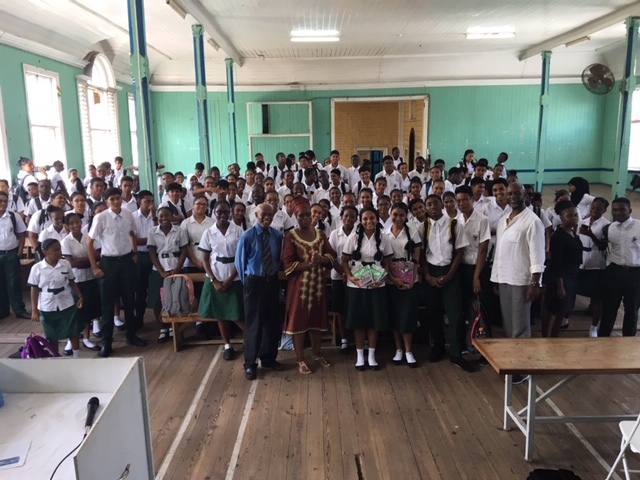 Back in Guyana’s Jubilee Year, 2016, I was invited by the National Library to be a member of a team to go to schools and do Sessions of Poetry and Storytelling sessions. The team went to many schools on the West Bank and West Coast Demerara, as well as to the East Bank Essequibo in Region Number Three. It all went so well, that I decided to continue solo, doing FREE Poetry and Storytelling Sessions around and about Guyana ever since. The project was even extended east across the Atlantic to Ghana, which was done while I was on a visit to that West African country. The sessions are for half an hour duration; twenty minutes of my actual Poetry and Storytelling, and ten minutes for questions, comments and criticisms by the students. In most cases, I commence with the Martin Carter short poem, “You are Involved”, and explain to the students that no matter how young they are, or simple they think they may be, they are involved in their home, school and community, one way or the other. Poems are usually of a wide range; serious, funny, inspirational; even about the elderly. With the latter, I get the students to think about the elders in their lives – their parents, teachers and other elders who they have to interact with. The short stories are the type which have some ‘edutainment’ – (a combination of Education and Entertainment) – to them, and in most cases, with audience participation. 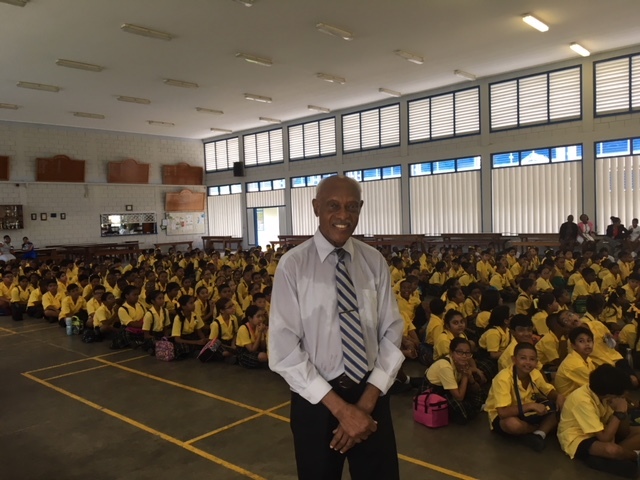 What I found surprising, or not really surprising, was the very same kind of reactions which I got from the students in Guyana, I also received from the students in Ghana, where I did two sessions. While one of the sessions in Ghana was pre-arranged, the other was spontaneous. I was with a Touring Group at Ada on the eastern coast of Ghana and was next to a school which had just ended classes. The students and the headmaster were in the school compound. I went across and introduced myself to the headmaster, told him who I am and what I do, and asked his permission to do one short poem for the students. His immediate response was to call out to the students in a loud voice, “ASSEMBLY”. His command was immediately carried out. He then introduced me to the students. “This gentleman is from Guyana. He will say a poem for you”. It was a magical moment for me at the end of the poem as the students clapped with glee. Just ten minutes earlier, I had no idea that I would have been addressing students at that school at Dangame on the eastern coast of Ghana. 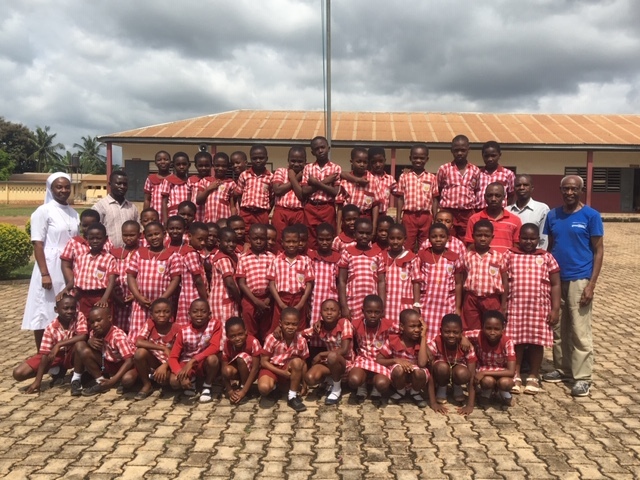 A few days later, hundreds of miles away at a hinterland city of Sunyani, I did a Free Poetry and Storytelling Session for the students of the Holy Spirit Catholic Primary School, where I was also well received. At the end of the session, every one of the students came up and either shook my hand and/or gave me a hug. It was a similar reaction when I did a session at the St. John’s Primary School at Bartica, in Region Seven, Guyana. For me, these Poetry and Storytelling Sessions, help to bring to students, not only a love for literature and the Performing Arts, but a bridge between the Young and the Elderly. As such, I plan to continue this project for the foreseeable future. 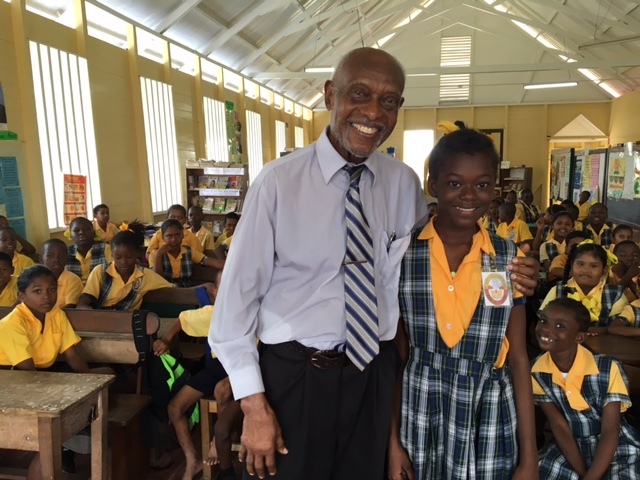 Farrier with the student who made the Vote-of-Thanks after the Poetry Session at the St. Ann’s Primary School at Agricola, post-Jubilee 2016. 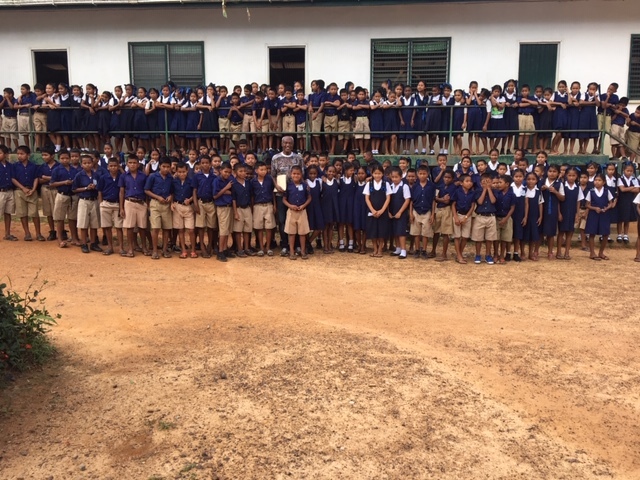 Farrier at center in front row, with some of the students of the Santa Rosa Primary School, Moruca, Region One, after a FREE Poetry and Storytelling Session, on November 7, 2018. A photo just before a Poetry and Storytelling Session at the Holy Spirit Primary School in Sunyani, Ghana, on October 4, 2018. At left in white is Headmistress Sr.Perpetual. Farrier is at right in T-shirt. 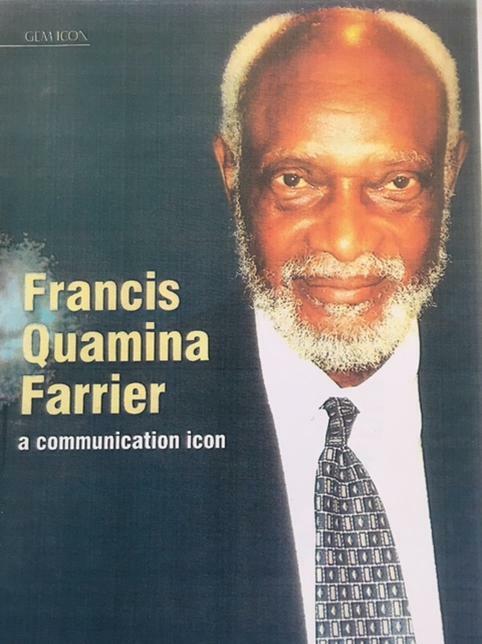 ​Farrier pictured here with students of the Marian Academy on Carifesta Avenue in Georgetown, where he did two Free Poetry and Storytelling Sessions during 2017. 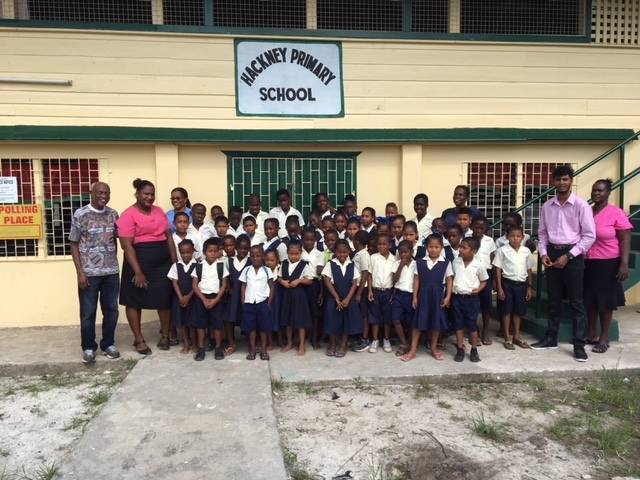 Farrier at left with Teachers and Students of the Hackney Primary School on the Pomeroon, Region Two, after a FREE Poetry and Storytelling Session on November 9, 2018.